The purpose of this chapter is to examine if even the simplest trading rules could take advantage of the market's inefficiency and lead to profitable trading decisions. For this reason, this study examined the profitability of the simplest trading rules, using only the simple moving averages (SMA) rules that even an amateur investor could apply. In order to examine the specific issue a data sample from the Greek stock market during the period 2002-12 was used. The results suggest that even if one takes into account the most expensive transaction fees, the trading rules signal profitable investment decisions; therefore, even an amateur trader and/or investor who does not have a significant amount of money to invest (which may lead to reduced transaction costs) could take advantage of the market's inefficiency. Behavioral finance theories may provide some useful and alternative explanations regarding some of the reasons that contribute to the Greek stock market's inefficient environment. 3. Which are the possible trading strategies that could be applied. Market Efficiency: Suggests that prices constantly reflect all the available information regarding a particular stock and/or the whole market; therefore it is extremely difficult for an investor to beat the market. Weak Form Efficient: Market could be characterized as a stock market that enables the its participants to make systematically profitable decisions using only historical data. In this way investors are able to take advantage of the market inefficiency. Trading Rules: Are rules that technical analysts have defined through time and it is widely believed, if specific preconditions are met, they are able to adequately forecast future trends. 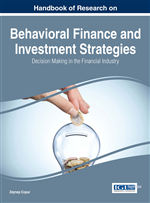 Behavioral Finance: Is a field of the financial theory that tries to examine the humans’ (occasionally we do not use the term investors) economic decisions taking into consideration factors that are not strictly linked to the quantitative finance. Behavioral finance uses knowledge from other scientific fields (e.g. psychology, neuroscience, sociology etc.) in order to give alternative explanations where the financial theory cannot. Herd Behavior: Is the investors’ tendency to follow the larger groups’ decisions even if their own information and/or estimations do not suggest it.